​​SAN ANTONIO – The city's retail market showed positive signs during third quarter 2017, according to the latest retail mark​et r​eport​ by CBRE​. 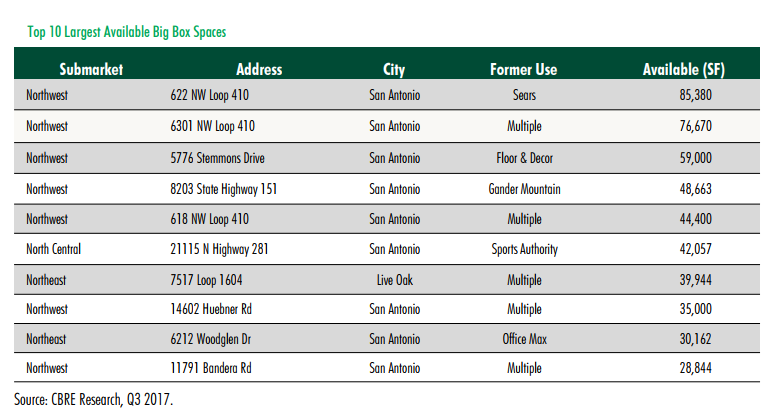 The occupancy rate held firm at 95 percent, and additions to San Antonio's grocery store offerings pushed net absorption to 181,491 sf and under construction space to more than 375,000 sf. the construction pipeline increased by more than 45,000 sf. ​​For quarterly data, see San Antonio-New Braunfels Retail Market Research.